KMix is now ported to KDE Frameworks 5. 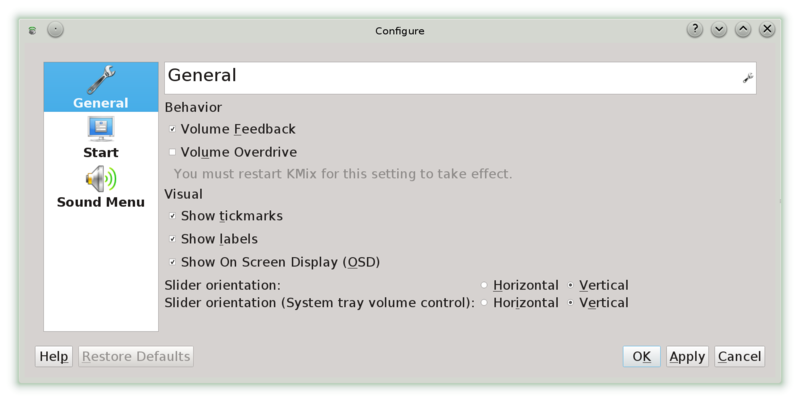 After a one day long porting effort, the basic functionality of KMix is available: Main Window, Systray, Volume Key Shortcuts, Sound Menu, volume save and restore. More sophisticated parts require more efforts and are currently missing, like the On-Screen-Display (OSD), which requires a port to Plasma 2. Soundcard hotplug and unplug is also not yet available, as support for this has been dropped from KDE’s Solid libraries. Alex Fiestas explained during the KDE Sprint that it was necessary to reduce complexity in Solid, and that Soundcard hotpluging is not a very widespread usage1. The required code will thus move to KMix in a later porting step. The part that looks most changed optically is the configuration dialog. In the picture you see some style changes from KDE Frameworks 5. All other changes can be seen in http://quickgit.kde.org/?p=kmix.git . 1 To avoid confusion: “Not widespread” refers to the number of applications using this feature. Users tend to hotplug their devices obviously frequently. Seems to me like plugging in USB headphones (which act as a new sound card, causing a new device to become available in PulseAudio or creating a new /dev/dsp in FreeBSD) *is* something that can happen, and can happen easily. Adrian, you are right. My post was misleading, and thus I added a footnote to the post to avoid confusion. Thanks for the hint. I assume the hotplug issue only affects ALSA, not pulseaudio? @lurchi: PulseAudio and also MPRIS2 work properly, as they do not use soundcard hotplugging. They simply add and remove controls on existing soundcards. I just tested it with Amarok, and it actually works. Hi, I dont know if there is a place to submit suggestions to the kde devs.. so I’ll put this here: .. I’m listening to music at full volume… now some page at the broser triggers a quick sound destroying my ears.. so I go to the kmix but the browser channel is not there anymore as the sound was really quick.. so.. it would be a nice feature to make the channels (or streams or whatever you name it) to stay for at least 10 seconds? Carlos, if it is an “Event sound” it should be present at all times. I have seen one time that it appears and disappears quickly, but as far as I understand it has been a distribution bug. I would recommend that you look at forums to find a solution. Or file a bug for your distribution, but please test with a different mixer like pavucontrol before doing so. In general KMix is in considered feature-complete. While you can still add feature wishes to http://bugs.kde.org/ , it is not likely it will find a volunteer who will do it. I do not recommend you add it as a wish. 1- Send stream to card X, 2- Display app streams in main panel (instead of settings panel). Thanks a lot ! Are you actually using KMix, or the new KDE5 volume control? Please note there are 3 mixers available. For quite some time there has been done no work on KMix 4 and KMix5. I am not planning to change this unless I see critical bugs or the need for (e.g.) hotplugging.